Just as there's no such thing as "a bad time to live", there's no such thing as "bad time to visit" one of the most scintillating and marvelous wonders of the world, the Taj Mahal. Whatever be the time of the year, the Taj Mahal will not stop with its mission to spread its charm and glory and will continue to be as luminescent as ever. But as a visit in the months of summers requires a high threshold to bear the heat, the period between the comparatively cooler months i.e. 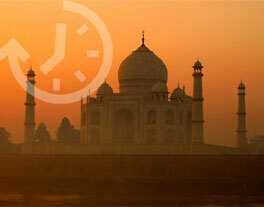 October to March is generally considered a best time to visit the Taj Mahal. Having said that, know that the radiance of the Taj Mahal is simply dazzling, and changes with every passing hour, reflecting a different aura in different seasons. Also, the visual beauty of the Taj Mahal is at its peak during sunrise, sunset, and under the full moon night. Watching the sun rise up from under the sea of sky is a sight to behold, and what better way to experience it than to watch it take its place up there while you stand on the premises of one of the Seven Wonders of the World. It's a moment of delight when the beauty of the sunrise and the Taj Mahal culminate together to make for some awe-inspiring images of the Taj, being transformed from soft grey and pink to a soft red glow. After shining its glory all through the day, when the sun climbs down the stairway of heavens and gets ready to say adios to the world, it plays its final trick in the book by lending Taj Mahal a different appearance with the shades of fiery yellow being transformed into soft exotic orange and finally to pearl white again, until the full moon prepares itself to accompany the Taj all through the night while dazzling the world with its quiet heavenly elegance. By the night when the full moon is high up in the sky, the beauty that Taj Mahal breathes out is beyond the scope of words. A silver glow that takes over Taj Mahal is so mesmerizing that most of the things you'll see after that will feel ordinary at best. This fabulous interplay of colors all through the day, and then night, symbolically implies the presence of God, who is never represented in the anthropomorphic form. The best time to arrive would be just before the sunrise or sunset. Night viewing is allowed on the full moon night, two days before it and two days after it. Tickets for the same need to be booked one day in advance.